The English Language Canon Powershot SX130IS owner’s manual / operating instructions (Canon calls it the “PowerShot SX130 IS Camera User Guide”) is now online and available for download at Canon.com (right-click and save the user guide to your hard drive). If the download link for the SX130 IS user manual didn’t work for you, go to the Brochures & Manuals download section for the SX130 IS and manually locate the file PSSX130IS_CUG_EN_03.pdf. 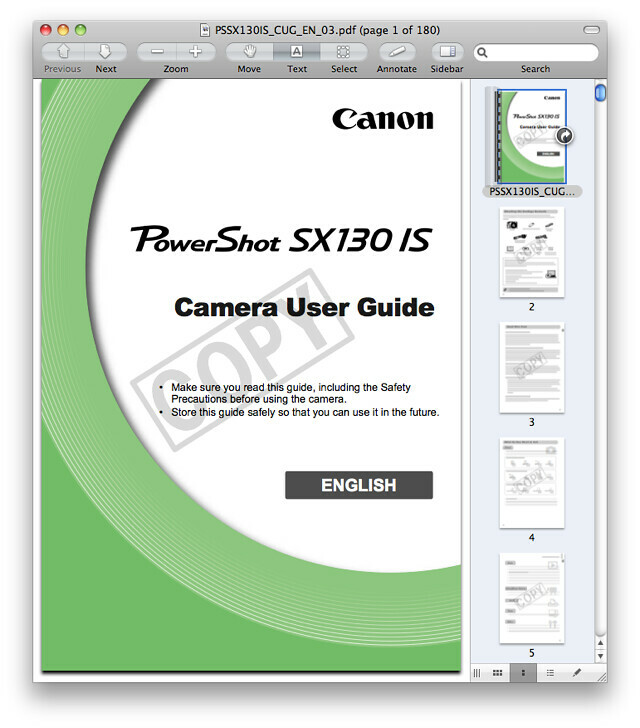 Unlike with Nikon, Canon allows you to freely print the Powershot SX130 owner’s handbook without building in any password protection into the PDF. There is a watermark displayed on each page though, and re-saving or copying portions of the manual does require a password. The file size of 180-page Canon SX130 IS Adobe Acrobat PDF document is 10.7 MB (megabytes). The guide discusses the features of the SX130 and how to use the camera. 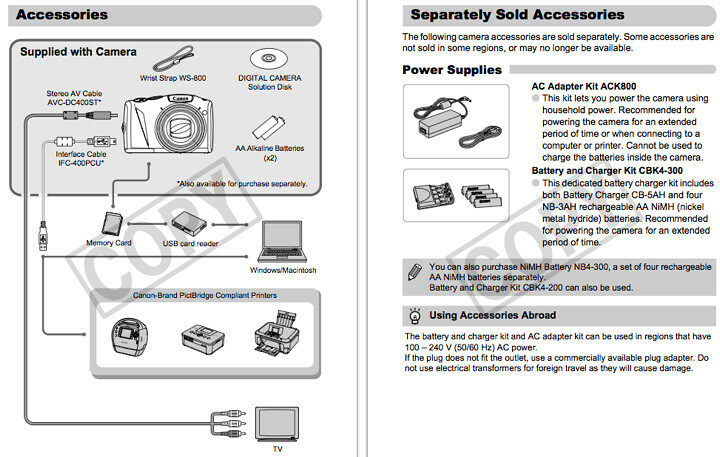 AC Adapter Kit ACK800, which consists of Compact Power Adapter CA-PS800, DC Coupler and Power Cord. This allows you to use household electrical power source if you intend to use the SX130IS for an extended period of time. Note that this kit cannot be used to charge a battery in the camera. Popular Canon SX130 IS books and other printed literature and reading material in the Arts & Photography and Books section on Amazon.com.